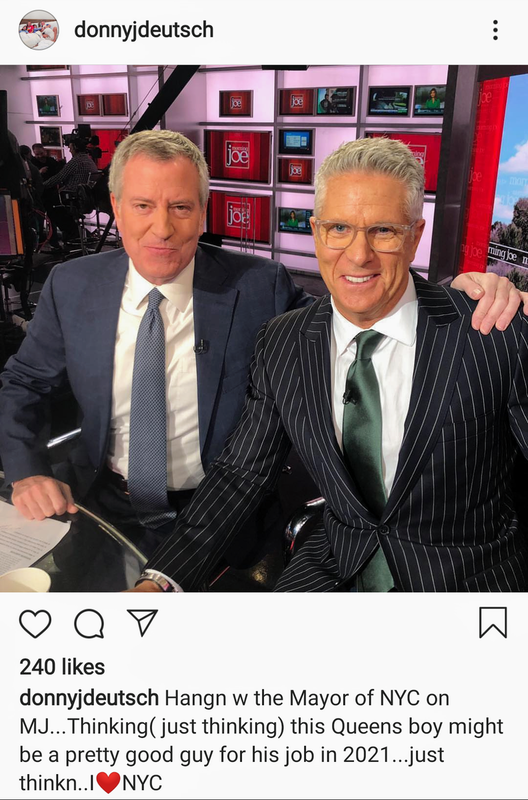 Donny Deutsch, a second-generation ad man and cable TV personality, this morning announced he is considering a bid for mayor of New York City. “Thinking (just thinking) this Queens boy might be a pretty good guy for his job in 2021,” Deutsch commented on a photo of him posting with current New York City Mayor Bill de Blasio on his Instagram account. Deutsch, also a regular commentator on “Morning Joe,” and former chairman of Deutsch Inc., an agency founded by his father David in 1969, but which Donny Deutsch ultimately succeeded him as head of and sold it to Interpublic in 2000 for more than $200 million. 1 comment about "Mayor Donny Deutsch? Second-Generation Ad Man Considers New York City Bid". George Parker from Parker Consultants, March 18, 2019 at 8:43 a.m.
April Fools day isn't for a couple of weeks.